The lymphatic system, one of the most vital systems in the body, is essential for good health. The lymph system is an extensive drainage network that helps keep bodily fluid levels in balance and defends the body against infections. It is made up of a network of lymphatic vessels that carry lymph — a clear, watery fluid that contains protein molecules, salts, glucose, urea, and other substances — throughout the body. 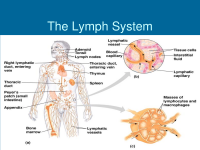 The lymphatic system, a major part of the immune system, is very complex and it is made up lymphoid organs, lymph nodes, lymph ducts, lymph capillaries, and lymph vessels that make and transport lymph fluid from tissues to the circulatory system. Did you know that the spleen, tonsils, lymphocytes and thymus gland are all part of the lymphatic system? Lymphocytes (white blood cells) are built and stored in lymphatic tissue. Each lymphatic structure has a specific purpose. There are 600 - 700 lymph nodes in the human body that filter the lymph before it returns to the circulatory system. Approximately 1/3 of them are located in the head and neck. They range in size from a pinhead to a broad bean and are arranged in clusters or chains. While we know where they are situated, the exact arrangement is unique in each person. Unlike blood, which flows throughout the body in a continuous loop, lymph flows in only one direction — upward toward the neck — within its own system. It flows into the venous blood stream through the subclavian veins, which are located on either sides of the neck near the collarbones. Lymph leaves the tissue and enters the lymphatic system through specialized lymphatic capillaries. About three-quarters of these capillaries are superficial capillaries that are located near the surface of the skin. There are also deep lymphatic capillaries that surround most of the body’s organs. Manual lymph drainage (MLD) is a gentle, non-invasive manual technique that uses specific "stretch-and-release" movements on the lymph nodes. The movements act as a type of external pump that pulls lymphatic fluid through the lymph channels and enhances the release of toxins. It is a highly specialized form of massage, which uses light, rhythmical, very precise hand movements, pressures and sequences and requires the therapist to develop a great degree of skill, having an intimate knowledge of the workings of the anatomy of the lymphatic system. 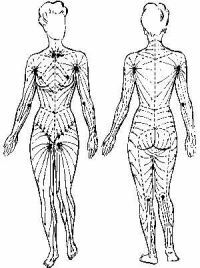 The massage works at a skin level to influence the direction and speed of lymphatic flow, re-directing if necessary. The MLD session is not the same as a traditional massage as the movements are specifically designed to increase the flow of lymph - too much pressure on the lymph nodes can cause thickening. The skin is stretched and released in a specific manner, based on scientific, physiological principles that have proven to encourage lymph flow. When performed correctly with the correct pressure, direction and speed, MLD can greatly enhance recovery and facilitate drainage. The efficacy of MLD is no longer doubted and it is practiced in many locations worldwide. Gradually, more massage therapists, aestheticians, physical/occupational therapists and other healthcare practitioners took up the therapy and have used it with great effect. Some indications (may be helpful) for MLD include: post-traumatic and post-surgery edema, fibromyalgia, chronic fatigue syndrome, rheumatoid arthritis, tinnitus, scleroderma, migraine/sinus headache, palliative care, pain control, follow-up treatment to deep tissue work, general relaxation and detoxification, enhanced immune function, lymphedema, and lipedema. And, of course, there are contraindications (should not be used) for MLD, such as acute infections, untreated congestive heart failure, acute deep vein thrombosis, etc. Please discuss this with your therapist first in regard to your specific medical condition. Take a moment and click the link below. You will be able to read about the manual lymph drainage service that I offer (info, pricing, discounts, etc.) at Two Roads Massage Therapy. Contact me for a session. 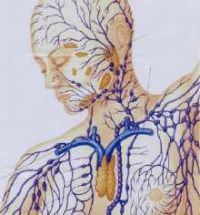 Here's an informative online article about our lymphatic system - from Pacific Medical Training, PMT Scribe Academy. It contains a wealth of information about our body's lymph system. Complete Decongestive Therapy (CDT) is administered by a certified lymphedema therapist (CLT), who is the provider of choice to administer this treatment. Although lymphedema in the past has been overlooked or misdiagnosed , a growing number of certified practitioners are using the conservative treatment techniques of manual lymph drainage and complete decongestive therapy to effectively treat lymphedema patients. The clinical importance of lymphatic system disorders is becoming better known among members of the medical community, including physicians and therapists. Most prominent of these disorders is lymphedema, which involves a build-up of protein-rich lymph fluid in the interstitium. Some of the most common known causes of lower extremity lymphedema include pelvic or lower extremity cancer and cancer treatment (e.g., lymph node resection or radiation) that can damage the lymphatic system. Other causes may be more subtle, such as an insect bite or sunburn that could irreversibly damage an already compromised and susceptible lymphatic system. Though lymphedema can be found in all types of individuals, active and fit individuals are less likely than obese individuals to develop lymphedema. NLN is a driving force behind the movement in the United States to standardize quality treatment for lymphedema patients. It also supports research into the causes and possible alternative treatments for those who are at risk for lymphedema and for those who are affected by lymphedema. Here is an inspirational story that tells one man's journey of coping with lymphedema through humor and male bonding: A Man's Guide to All Things Lymphedema by Kevin L. Donahue.